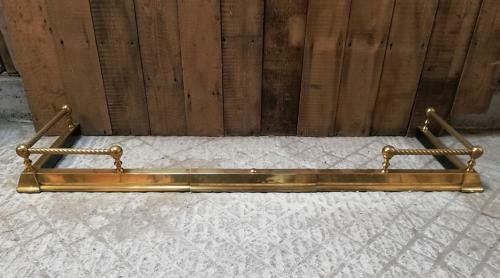 A fantastic, decorative, brass fire fender. The fender has a simple stepped brass design with attractive rope design sides and ball finials. There is a simple brass plate in the centre of the fire fender. The fender is designed to sit at the edge of the hearth and adds style and protect the floor from ash. The brass has been cleaned and polished and has a fantastic, high shine, finish. The fender is in good, antique, condition with some character signs of use and wear. There are some light tarnish, marks and slight signs of use. In solid and useable condition. A lovely classic style item thats attractive design would give a hearth great style, character and charm.